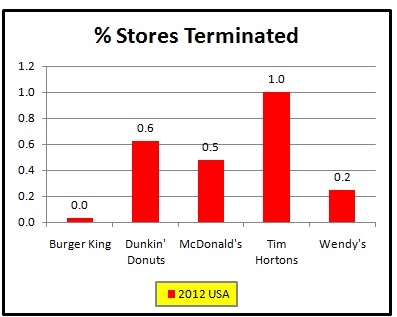 How frequently does Tim Hortons terminate their franchised stores in the United States? 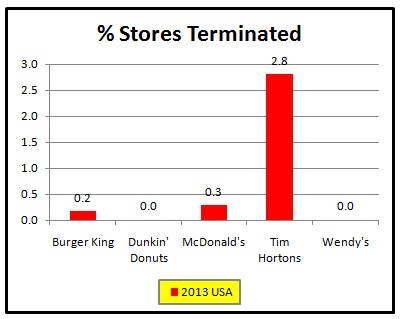 Termination of a franchise agreement is the most financially devastating action a franchisor can take. Responsible franchisors avoid this too because it is such a red flag to the investment community. It is only fair to compare it to their peer group and to best practices. ie. 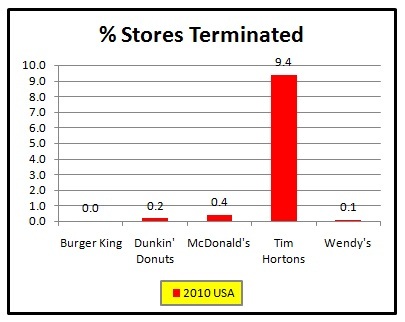 Tim Hortons terminated their U.S. franchisees 22.9, 1.1, 2.1, and 9.4 times more frequently than McDonald’s had done in the same year (2010 to 2013). 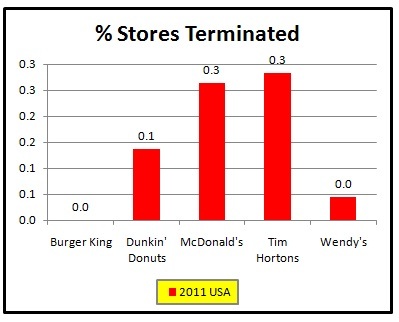 The frequency that the franchisor chooses to terminate a franchisee is a material fact to any buying or renewing franchisee. Source: Information from Franchise Disclosure Documents (see for example Wisconsin Department of Financial Institutions). Free download for U.S. filed documents. One of 4 online sources. Canadian information is unavailable because no provincial law requires these CDN documents to be (1) publicly filed or (2) put online. This entry was posted on Tuesday, February 24th, 2015 at 9:16 am and is filed under Bright Ideas, Greatest lies are told in silence. You can follow any responses to this entry through the RSS 2.0 feed. You can leave a response, or trackback from your own site.